Dr. Hausladen is a graduate of Yale University and the Washington University School of Medicine. He completed General Surgical training and residency training in Urology at Yale University School of Medicine. 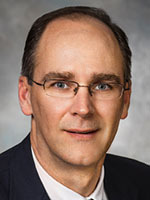 Board certified in Urology, Dr. Hausladen is a Diplomat of the American Board of Urology, and a member of American Urological Associates, the American Association of Clinical Urologists and the Endourological Society.